Vancouver has been internationally recognized with a number of awards and accolades, including the Berlitz "Most passenger friendly port in North America" award, Dream World Cruise Destinations magazine's "Best Turnaround Port Operations" award, and "Best Turnaround Destination" award. Today, the Port of Vancouver benifets from the infrastructure left behind from the 2010 2010 Olympic Games. Vancouver is the only homeport offering both one-way and round-trip itineraries through the picturesque Inside Passage along the west coast of British Columbia to Alaska. Departing from Vancouver, the closest home port to Alaska waters provides you with more time to spend in Skagway, Ketchikan, Juneau and Glacier Bay. You have the option to choose from a variety of ships, departure dates and itineraries. Cruise lines sailing out of Vancouver include Celebrity Cruises, Holland America Line, Princess Cruises, Royal Caribbean International, Crystal Cruises, Oceania Cruises, Regent Seven Seas Cruises, Silversea Cruises and many others. Vancouver is the only Alaska Cruise Port offering One-Way Alaska Cruises traveling through the Inside Passage between Vancouver Island and the mainland of British Columbia. Vancouver offers a variety of itineraries, including the choice of round-trips or one-way trips through the scenic Inside Passage. The Inside Passage, which runs along the west coast of British Columbia, allows passengers to fully experience the glaciers, mountains, wildlife and culture of America's last frontier. 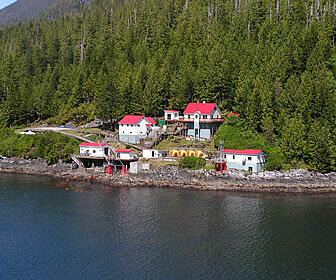 The shorter travel distance to Alaska via the Inside Passage gives your guests more time to spend in Alaskan ports. The Inside Passage route also offers the unique option of an itinerary that calls at other British Columbian ports, such as Victoria, Nanaimo and Prince Rupert.